Atlanta’s city center is bustling again, with more changes on the horizon. This is an exciting summer for Downtown Atlanta and its citizens. Within a few short weeks, the National Center for Civil and Human Rights, the Atlanta Streetcar and the College Football Hall of Fame are all opening. There’s activity around the BeltLine, the energizing presence of more students downtown – and sufficient talk of new initiatives to soften the blow of the Atlanta Braves impending departure for Cobb County. To help put all of this in perspective, Georgia Trend turned to longtime Atlanta civic leader A.J. 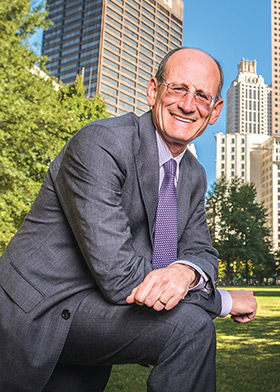 Robinson, president of Central Atlanta Progress, the 70-year-old development organization, and the Atlanta Downtown Improvement District. Robinson believes we’re seeing the start of another cycle of urban rejuvenation, comparable to when the city was preparing for the Olympics. Susan Percy talked to Robinson in his office downtown. Following are edited highlights from the interview. GT: There’s a lot happening downtown. What got it going? Robinson: All of this actually started at the turn of the century when the Aquarium was announced. There was a lot of work done here to push the community, much like the work done in the early ’90s. We had this opportunity, and we needed to capitalize on it much like was done prior to the Olympics. There was a lot of progress, say, from ’03 to ’07, because the real estate cycle was good. There was a lot of energy. The Aquarium opened, the World of Coke moved, we started talking about the BeltLine. Then the recession came. We lost four years – not just downtown, but the whole region. GT: When did things turn around? Robinson: I think it was the Final Four last spring. It was like a light bulb went off all of a sudden, back to a better cycle and better things. In the meantime, we had been working on the Big Five. GT: What are the five? Robinson: Three of them are kind of public-private partnerships: The College Football Hall of Fame, the Center for Civil and Human Rights and the Streetcar. These have been tracking through the recession. They just happened to end up [opening] in the same year. The other two we like to talk about – [one is] the return of the Polaris Lounge on top of the Hyatt. GT: That’s more than just a lounge opening, right? Robinson: That has some kind of iconic history – in ’67, when it opened, that was a tourist attraction that defined Atlanta. When people would come here, you could go to Stone Mountain, Six Flags, the Cyclorama. Underground had not even [opened]. Look how far we’ve come. We have moved from a convention town where people come and go to a meeting. We’ve added the tourism. That’s what the Aquarium really did. We now have an eclectic group of assets. Add in the CNN tour, the Children’s Museum and the Streetcar, which can take you to to the eastern side of town to the Carter Center and the King Center and Historic Auburn Avenue. GT: So what’s No. 5 on the list? Robinson: Coca-Cola moved 2,000 people into SunTrust Plaza from Wildwood Plaza in Cobb County. To me, to many of us, that’s almost as significant as when Georgia-Pacific built their building here in the late ’70s or early ’80s. GT: Why is all this happening now? Robinson: All across the country, there’s this movement into urban areas. Metro Atlanta has been slow [to follow]. We have our own spin on it: We created these nodes of infrastructure – Central Perimeter, Downtown, Midtown, Buckhead, Alpharetta. People are beginning to live, work and play in these areas. Before, all they did was work. We’ve discovered high-rise living. Who would have thought that Atlantans would be living in 30- to 50-story towers in urban areas? We didn’t have that product. GT: So we were a little late to the urban party. Sounds like we’re catching up. Robinson: That urbanization of Atlanta is quickly happening. The BeltLine is affecting all that. The next generation is going to really push Atlanta into a much more urban campus. All of us in this public-private business are trying to stay ahead of all these trends. Let me mention one other thing happening over these last 10 or 15 years. Right down here in the central city, we’ve been surrounded for many years by decaying public housing. We have to pay homage to the Atlanta Housing Authority, which has redone all the old public housing projects around the central city. When people come in now, they are not passing by some of the worst public housing in the nation. GT: So 2014 is a banner year? Robinson: All of this has been building up for some time. It just happens that in 2014 a lot of it is culminating. Georgia State is exploding – there’s a tremendous amount of kids living downtown. That just wakes up the sidewalks in a way that nothing else [can]. GT: Tell us more about the National Center for Civil and Human Rights. Robinson: This project could potentially redefine Atlanta and the metro area in a way almost like the Olympics did. Most people think this is going to pay homage to Atlanta’s history from 1955 to 1965, and it’s going to be a museum – and that’s it. It’s going to do that, but it’s going to do that in a different way than has been done before. The idea is to take Atlanta’s history and what happened here and show how it led to the Human Rights Movement that spread across the country and do it in a way that’s inspirational to people, so that they leave believing that they, too, can change the world. Part of it is the King Papers. They are housed at Morehouse, and they are going to rotate [at the center] on a permanent basis. We’re going to have this place that really speaks to the heart and soul of Atlanta and Georgia, to some extent. What really happened here was special. We were the place where it all started. We’re not just about sweet tea and fried chicken. GT: Why did it take Atlanta so long to have a civil rights museum, when places like Birmingham and Memphis have had theirs for years? Robinson: The King legacy, it overshadowed [everything else]. We’re trying to celebrate everybody’s contributions, whether it was the student movement or John Lewis or C.T. Vivian or Andy Young. We’re really trying to be about the future. It took us a while to figure it out, and I’m hopeful that people appreciate it when they see it. It’s different from anything. The architecture is different, the space. GT: What else are you looking forward to? Robinson: The project of the old Sears Building [Ponce City Market]. This project is going to redefine urban office and mixed-use. This [new professional] generation seems to like old buildings that have big ceilings, character, history – and yet they want it to be functional. Everybody is interested in taking something that’s old and making it a cool space. GT: Is the idea of adaptive reuse likely to extend to Turner Field? GT: Is that an even exchange? Robinson: No. It’s hard to replace a major league sports program, but I’m optimistic something positive will be happening there. GT: And the new Falcons’ stadium? Robinson: I try to tell people this is much more than a football stadium. It’s a unique piece of infrastructure that is going to be used a lot of ways. I think the Falcons and Arthur Blank are very motivated to bring a lot of new things into our community that we didn’t envision. GT: What needs to happen next to keep downtown Atlanta moving ahead? Robinson: We have a lot of infrastructure challenges for the city – so many things that need to get fixed, from sidewalks to streetscapes – and [public K-12] education. Those things are ongoing challenges. We still have a significant homeless population here – it’s a tough problem. GT: What’s making those tasks harder? Robinson: One of our biggest challenges always is to get people in the metro area to understand the importance of the central city and really to care about it. GT: Would you talk about transit and transportation? The ambitious T-SPLOST was defeated. Where does that leave us? Robinson: We did not get the T-SPLOST done, and in retrospect it was so grandiose in its mission – it was not simple enough for people to understand how it would make [their lives] better. GT: So what is likely to work? Robinson: What I’ve learned is that unless there truly is a crisis, not much gets done in the public sector. The crisis in transportation is occurring, but [it’s] not occurring all in one place. People are beginning to realize there’s not one solution to solve the one big problem in transportation. That’s why I’m encouraged that we were able to get the Streetcar done. It’s new technology that can show people you can get something done here around transit. You just need to think about what problem does it solve. And do it. GT: What problem does the Streetcar solve? Robinson: We’re building the Streetcar not for problems of today, we’re building it so that young folks can continue to come here and live here and don’t have to be in a car. That is the lifestyle. We’re competing against Washington [D.C.], San Francisco, New York, all these other places. If we don’t invest in the urban infrastructure, they are not going to come. They can work anywhere – do anything from anyplace. It’s a different lifestyle they’re choosing as opposed to being in the big house with the big yard. GT: What about other kinds of transportation? Robinson: I’m optimistic that because the whole transportation issue continues to plague us, our political entities and our business community are somehow going to find a way to do something. It may be a smaller jurisdiction – people talking about a city and county getting together, two counties getting together and working on something. I think if you simplify the real project list and make it clear how it really benefits people the next time around, if it’s a half a penny or penny [tax] or whatever, you’ll be successful. GT: How did downtown fare during this year’s legislative session? Robinson: The good news is that it was short. We were, most of us, just so thrilled they didn’t do things that would continue to erode our reputation as a progressive, important place. More and more companies in Georgia are beginning to focus on not letting the legislature pass crazy laws about social issues. I guess it’s good political grandstanding in an election year. But we’ve got to be very vigilant. GT: Tell us about the role of Central Atlanta Progress. Robinson: The organization is over 70 years old, and I think it continues to be true to the mission of what it was when it was created: a group of business guys recognizing they don’t control the world, but trying to figure out what they thought was best for the community and selling that concept out to other businesses and the public sector – whether city government, county government, state government – trying to raise the aspirational level of the community in a way that doesn’t always come from the public sector. I think that mission is still relevant today. GT: Anything changed in the way you go about fulfilling your mission? Robinson: We’ve become more active in the rise of improvement districts, using the precious resources we have to invest in the community as opposed to trying to get others to invest, either public or private. We’re invested in the Streetcar, streetscapes, invested in banners, wayfinding signs that in a perfect world ought to be coming from government. Another part of CAP has always been a convening mission – trying to bring people together in a collaborative way to solve issues. We’re a safe place where people can discuss and try to reason with each other. Diversity leads to a need for someone to help convene those diverse interests. GT: The Atlanta business community has a history of civic engagement. Robinson: We’re a reflection of what I think is just an incredibly dynamic business community, more civically involved than a lot of other places. It’s one of Atlanta’s real strengths – getting people [together] who care about something beyond their own business mission. We are an extremely open city. That is one of the real special traits here. If you want to engage, there is plenty to do. GT: So Atlanta is in a good place now?